In this series on getting your estate organized, we recently looked at social media. Now it’s time to move on to digital property and accounts at major companies. You probably have dozens of online accounts and possibly hundreds of dollars worth of digital property in the form of music, audiobooks, e-books, photos, and other files. What happens to it when you die? As with social media, different companies have different policies, but the best way for your heirs to handle them is generally to contact the company, send a copy of the death certificate, and be prepared to show that they have the right to act on behalf of your estate. It might be worth noting somewhere if you have specific wishes for what should happen to your files and accounts. Apple – contact them; you’ll need a copy of the death certificate and if you don’t want to just cancel the account, include a legal document confirming you have the right to transfer the deceased’s property. All items will be reviewed by Apple’s legal team and the process will go from there. Audible – Heirs can transfer the account from the deceased to themselves, or cancel the account. Canceling means you lose the content and any credits toward other audio books. As with all digital estate law, the rules may vary by company and by state. Some people suggest naming a person in your will to be your “digital executor” to deal with your online accounts. This can be the same person who is the executor of the rest of your estate, but it is at least worth considering listing some powers in your will to deal with your online life. 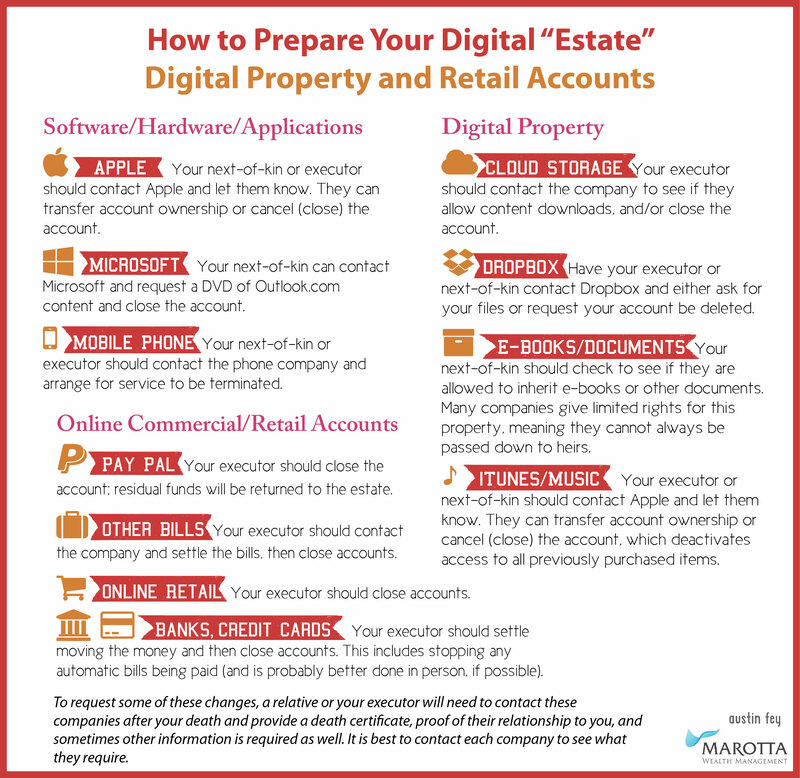 In the case of digital property such as music and books, it may or may not be possible to pass them down to heirs depending upon the use license the company provides when you purchase the item. Talk to your estate attorney about how to set up this part of your estate so your wishes are honored. For more on getting your estate in order, see my articles on a power of attorney and medical directives, organizing your physical assets, choosing an executor, and organizing your online presence.